When you hear the term ‘food waste’ it can sound daunting, right? It seems like it’s something happening far away from us, and we have no control over it. But the truth is, food waste is all around us – and, more importantly, caused by all of us. In the UK, we waste around 10 million tonnes of food each year, according to a report published by WRAP (Waste and Resources Action Programme) based on three major studies between 2013 and 2016. With 41 million tonnes of food purchased yearly in the UK, this means a quarter of that ends up as food waste. Of that 10 million tonnes of food waste, 71% come from UK households. The rest is from manufacturing, retail, wholesale, hospitality and food service, and food waste in litter. The more food wasted, the worse problems such as hunger and food poverty become. There are also economic and environmental impacts to consider. So, what can we, as ordinary citizens, do to help reduce this unnecessary waste? Here are five practical steps you can take to do your part. 1. Buy and cook only what you need. This is probably the simplest yet most difficult item to accomplish on this list. We simply tend to ‘play it safe’ and purchase more than we can consume. While being prepared for rainy days is important, we must also be realistic. Overstocking and cooking more than can be eaten leads to food unnecessarily thrown out – whether it be due to expiry dates lapsing or too many leftovers going sour in the fridge. This simple step, if everyone would do it, can collectively make a significant impact. 2. Don’t throw away leftovers right away. Get creative with it! And where there are leftovers, try hard to make throwing them out a last resort. There are tons of different recipes you can try with leftover food. Get creative and whip up meals you’ve never tried before. BBC Good Food has an entire section devoted to leftover food recipes that you can peruse yourself! 3. Organise food at home. To get a clearer picture of just how much food you waste, try keeping a log of food you purchased, cooked, and threw out for a month or so. That way you’d know the best way to tackle it and in which areas you need to cut back on. At the same time, you could also organise your food storage – whether that’s inside the fridge or cupboards. Ensure food and goods with closer expiry dates are up front so you can consume them before they go bad. Then designate a visible space in your fridge for leftovers, so you always see them and don’t they don’t get pushed to the back and forgotten after a few days. 4. Use food as fertiliser. According to the US Environmental Protection Agency, composting or using food as fertiliser for the soil and plants is the second least preferred method in a food recovery hierarchy (which you can view here). With reducing, donating, diverting food to animal feed, and industrial use being the most preferred options before it. But this still is an option when you’ve exhausted the steps above. It’s better than just chucking food in the bin. 5. Volunteer for, support, or donate to charities like FoodCycle. At FoodCycle, we collect perfectly edible surplus food from supermarkets and turn them into delicious, healthy meals for the community. This is how we work to reduce food waste in the UK, while creating a safe and warm environment for our guests, who may experience loneliness or hunger. In 2017, FoodCycle had a huge impact as we saved nearly 100 tonnes of food waste by serving a record of over 67,000 meals to our guests. 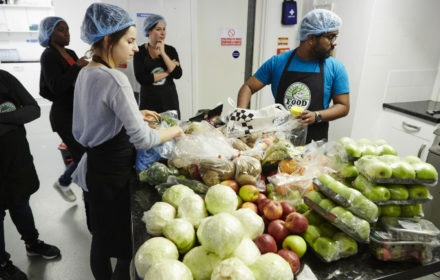 You can volunteer – and in turn help to reduce food waste – in one of our 34 projects across the UK by signing up over at volunteer.foodcycle.org.uk. We get our surplus food from local supermarkets, shops and markets, but you may choose to support us in other ways such as through fundraising. 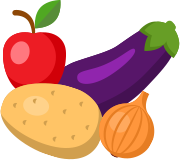 If you have surplus food you would like to share, apps like Olio can help you with this. Every little counts. And all of our participation is needed for change to happen.